As a youngster I remember the excitement and intrigue at turning over rocks on the beach to reveal fossils. I found it a fun way to learn about about fossils. Fossils are the remains of prehistoric life. They can also be other forms of evidence that such life existed. In order to become fossilised three basic conditions must be satisfied. 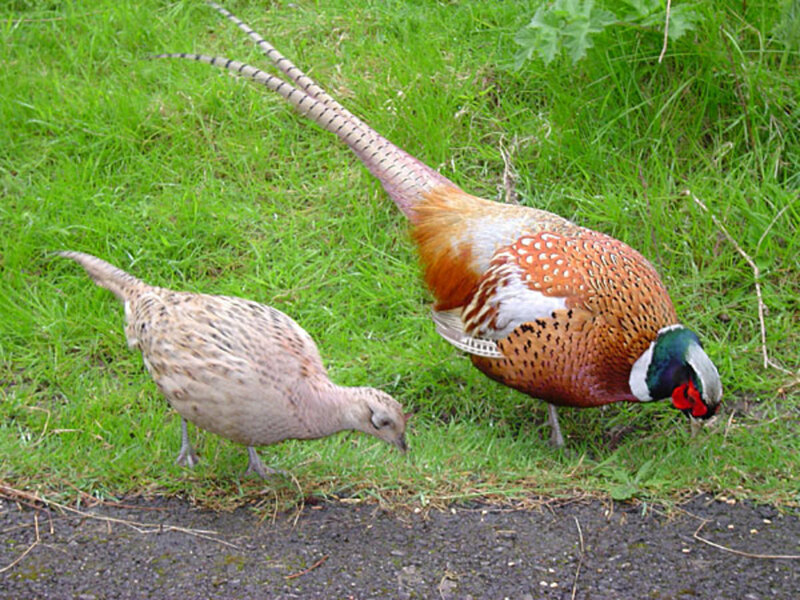 Firstly, an animal or a plant would normally have to have hard parts such as shell or wood or bone. Secondly, this must then be buried quickly to prevent decay and thirdly, this must remain undisturbed throughout the whole process of fossilisation. 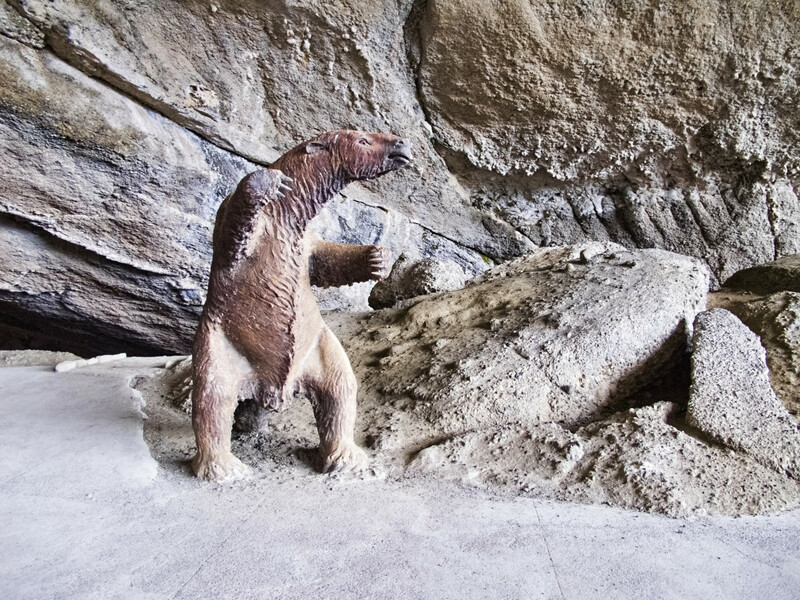 Some remains are preserved through a different process and in these rare cases, the animals have been preserved through freezing. An example of this are the discoveries of Mammoths as seen in Alaska and Siberia. These examples have been refrigerated in the freezing ground for the past 25,000 years. A further example of animals being preserved comes from semi-arid regions. In South America, mummified Ground Sloths have been found in caves, preserved by the unusual mixed conditions of cold, dryness and chemical action. It is rare to find fossils that are complete. For example, we might find an animal where only the skull or a few bones remain. Or we might find a fossil of a leaf. So how is it that we can then translate this partial fossil remain into an image of what the whole animal or tree might have looked like. Geologists do this by understanding what animals and plants are like today. They use their knowledge of today's animal and plant life to interpret the remains. 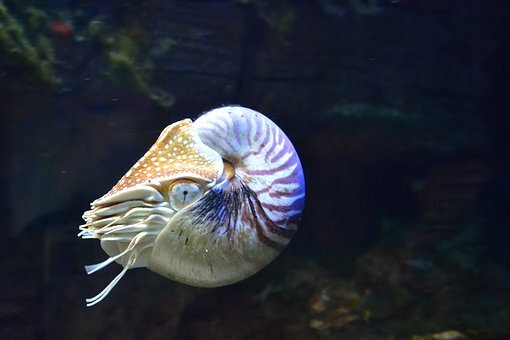 An example might be Ammonites, these have been extinct for some 70 million years, however there shells are similar to living Pearly Nautilus. The geologist assumes that the soft parts were also similar and reconstruct them to match. So what types are fossils are there? There are many types fossils and they are not always remains of bones or shells. Below are a few of the most common types of fossils. Mold Fossils are hollow impressions left in rocks. 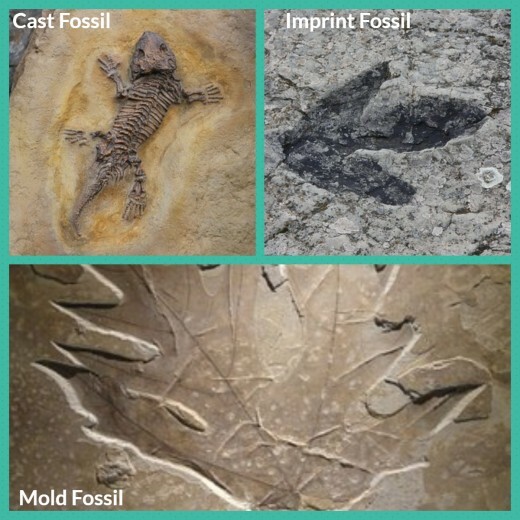 Cast Fossils are mineral deposit filled molds that leave a copy of the creature or plant behind. 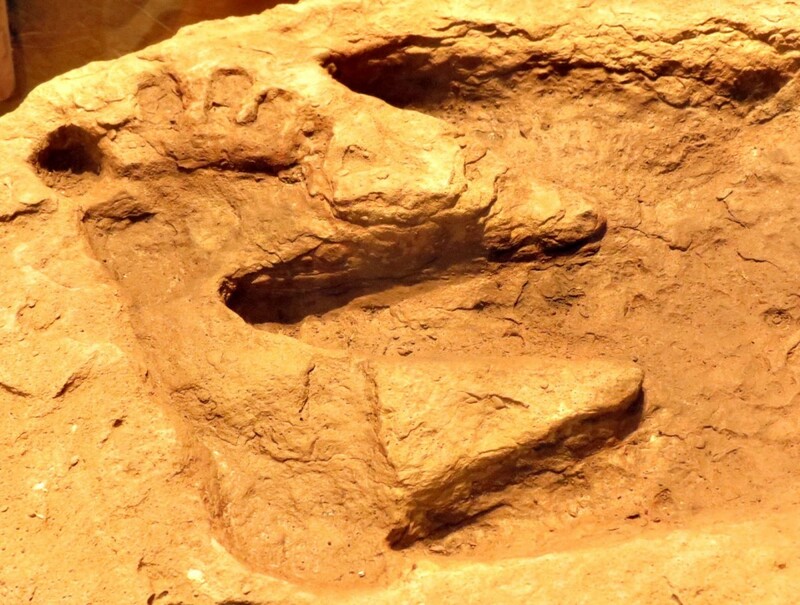 Imprint Fossils are from things such as footprints of creatures or even drag marks. Whole Fossils happen when plants or animals are encased in ice or sap - an example of this would be an insect trapped in amber. 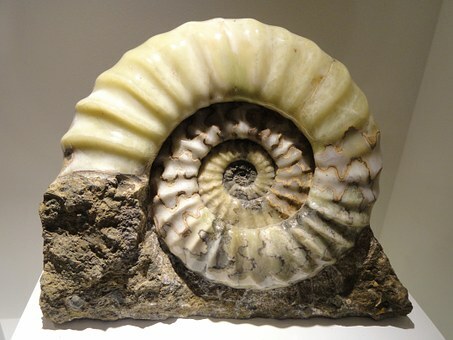 The most common form of fossils are the remains of shells or bones that have been transformed into stone. These can often show most if not all of the original detail of the shell or bone in minute detail. This is due to all the pores and tiny spaces in their structure being filled with minerals compounds like calcite which is calcium carbonate, which is dissolved in water. As the water passed through the shell or bone minerals were deposited in the spaces within the shell or bone structure. 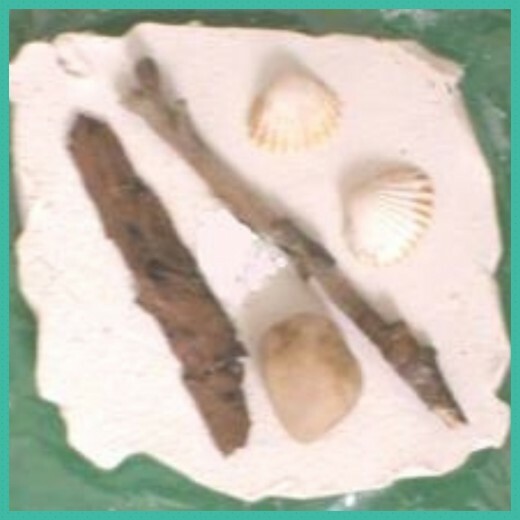 A fun activity for kids to make their own fossils. You can create your own "fossils" by following the instructions below. You can use anything small to form the fossil imprint. Examples might be leaves or shells. Modelling clay. Waxed paper. Plaster of Paris. Some vegetable oil. A container in which to mix the plaster of Paris. Step 1. place a ball of clay on a piece of waxed paper and flatten it into a thick circle. Step 2. make an impression in the clay. You do this by gently pressing in the object and then carefully remove it. Step 3. apply a little vegetable oil to the surface of the impression you have made (this makes it non-stick). Step 4. Follow the directions on the Plaster of Paris package so that it has the right consistency, then spoon the plaster of Paris into the impressions. Step 5. Leave the plaster to dry, which usually takes around 45 to 60 minutes, then peel away the clay. Your fossil will be revealed. Sedimentary Rocks the majority of fossils are found in sedimentary rocks. As the name suggests, these rocks are formed of sediments from clay, sand or mud. Limestone fossil finds are also seen in this type of rock. Made mainly from calcium carbonate, limestone is common in warm shallow seas. Shale another type of rock that preserves fossils. Made up of fine grains from clays and silt. People collect fossils for all sorts of reasons. For fun or for the excitement of that rare find. Sometimes it is just for the fact that it gets you outside and in the company of other like minded people. So where should you look for fossils? The simple answer is to look in sedimentary rocks. Rocks that have been freshly exposed are the best source. Along the beach, river bank and headland can be good sources. A word of warning though - always get permission from the land-owner and always watch out for loose rocks. Remember - safety first! Take time to survey the area, looking for those rock surfaces have weathered, possibly exposing fossils. You should turn over rock fragments looking on both sides. In the event that you discover bones such as vertebrae, you should leave the find intact and seek professional help. You wouldn't want to ruin what might be a significant and important find. It was during the 1800's that scientists learned a great deal about the study of rocks (geology), and about the history of life (palaeontology). The first important fossil finds were made by William Buckland, a professor of Geology at Oxford University, England in the 1820's. He named these finds "Megalosaurus" which means giant lizard. In 1825, Mary Ann Mantell found a large fossil tooth - this was later found to be from an Iguanodon. 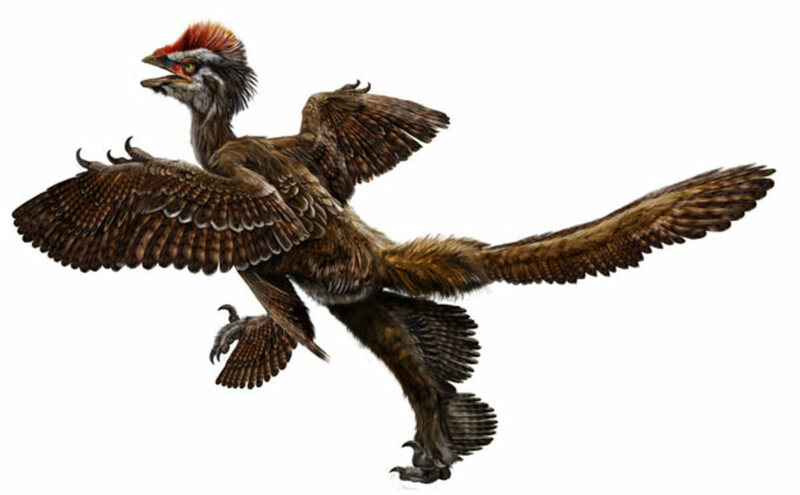 It was from early fossil hunters such as these that a whole new world of dinosaurs first emerged. Something to wrap your finds in - newspaper can be good. Fossils can be stored in cardboard trays. Labels can be written up and placed beneath the fossil. Alternatively, a bank of shallow drawers can be used. Another alternative is to use plastic or glass jewelry cases. You should first clean your fossils by brushing away the dirt - an artists brush would do the job nicely. You should also wash away any salt from the sea - soak then in cold water for a few minutes and then let them dry in the air. I find fossils to be so fascinating. I really like the images you have here. This is a great lens. I've found marine organism fossils a few times in the local hills here in Southern California, which used to be the bottom of a shallow sea during the Jurassic Period. Lots of fun. @Judy Filarecki: Thank you for your visit and comments - very much appreciated. Finding fossils were always an exciting event both for my self, my son and now my grandchildren. thanks for sharing. My little fossil hunter is now on her way to becoming a paleontologist. Terrific lens. All children enjoy fossil hunting I think. Yes, I have enjoyed your lens! Thanks a lot for sharing this great lens!!! Very very interesting lens about fossils. @TommysPal: Thank you - appreciated. I found what I think is a molar of a big animal while digging in my yard. My property use to be part of a mining industry I think. I'm guessing the tooth is from a mule or something of that size. It was exciting to find this. Great lens! @lesliesinclair: It would be amazing to be able to make a direct comparison with the living creature. Aren't fossils intriguing! It's fun to imagine how they looked when they were fleshed out. I have a piece of fossilised tree , I took this from a place on a farm in Zimbabwe where big stone tree trunks lie all fossilised . @RoSelou: Thank you - very much appreciated. Until now, I still collect stones with fossils embedded on it. It is mostly shells, no dinosaurs or even ammonite. I hope to find an ammonite, just like the first photo above. This is a helpful lens. Thanks! When my son was little he had a keen interest in fossils, great lens! @marktplaatsshop: I am pleased that you enjoyed your visit. @takkhisa: It is such fun too. @norma-holt: Thanks you - I have amended. Hi, You have an error on your second lot of questions. Invertebrate fossils come from animals without back bones. Otherwise enjoyed the lens. @delia-delia: Thanks for the visit and comments - always appreciated. I have found some fossils unintentionally...they caught my eye and to my pleasant surprise there was a fossil in it. My youngest daughter loves Geology and took it in Collage, but sidetracked to restate building...so still has to survey land.....Thanks for sharing! 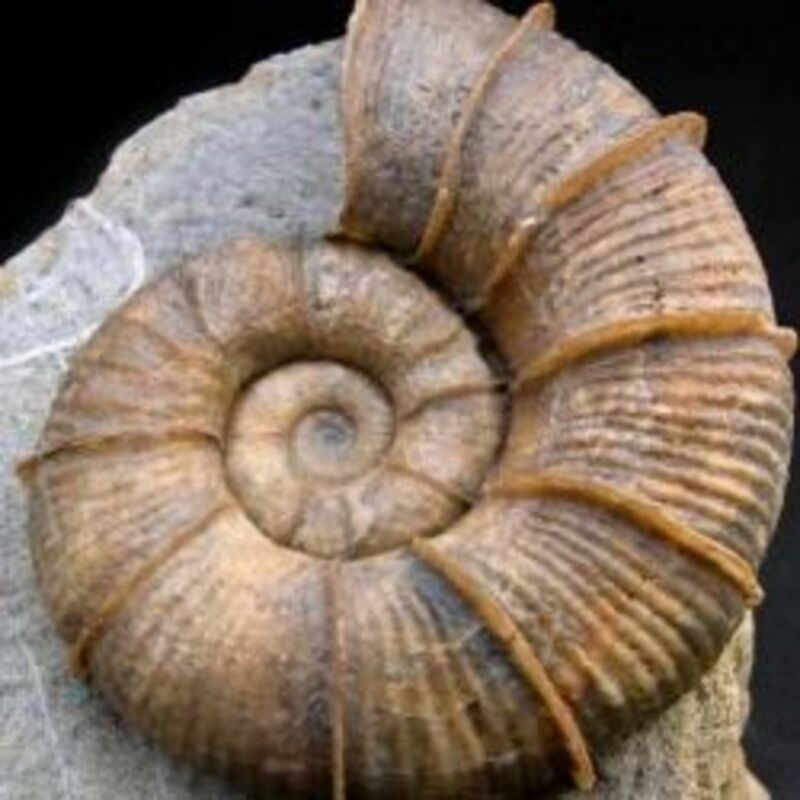 @anonymous: A love of fossils is a timeless thing. Hey. Grandma here is no kid, but I still love fossils. Have a couple on my desk right now plus some amber with a bee in it. Great fun. 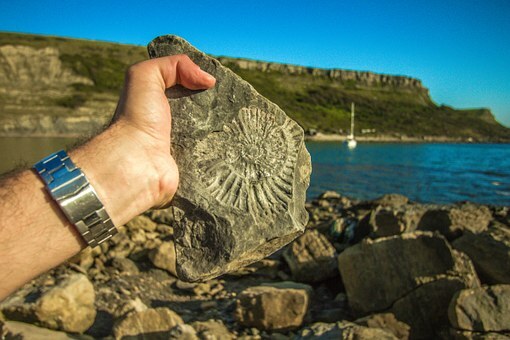 @John Dyhouse: I have hunted for fossils at Robin Hoods Bay too as a child - great fun. I think one of your commentator's summed it up best, a tangible link with the distant past. It is amazing to think about. Again, a really great lense, thanks for posting it. @TolovajWordsmith: I think its because a fossil is a tangible link with something from the distant past. I know that as a child, I was intrigued that I could actually hold something. It made it all the more real for me. I am always surprised when I see how fascinated are kids with fossils. Fascinating lens on one of my favorite topics. Well done. @worldflashpacker: Thank you so much. I adore fossils but always considered them to be out of my reach. This lens has taught me I can appreciate this natural phenomena at an affordable price. Excellent, informative and downright interesting. Well done, thanks for sharing and keep it up. @Bartukas: Thank you - I appreciate you comments. This lens is so imformative,thanks for sharing! @lionmom100: Thank you. Its those chance fossil finds that mean so much. Beautiful fossils. I found a small trilobite one once by a stream. @Dressage Husband: Thank you - very much appreciated. Very appropriately titled. Your lens sparked some of the enthusiasm I had as a kid. Thanks! @Elastara: Thank you for your visit and comments - always appreciated. Great lens on fossils for kids of all ages! This reminded me of my favorite subject Geography when I was in school! @EmmaCooper LM: Thank you - always appreciated. @Diva2Mom: Thanks for the blessing. One of the great things about having children is that you get the opportunity to revisit subjects again through their eyes. @weakbond: Fossils can be such a fascinating subject. What a fabulous fossil lens for kids, my children will really enjoy this! Fabulously BLESSED by a little Squid Angel. God bless you and Huge Hug! I was absolutely fascinated by fossils when I was a kid. I hope I can enjoy them again in a few years now I have a little daughter. @Sky Breeze: Its amazing to think about how much we can learn from fossils. I have never collected fossils before but find it very interesting! @JeffGilbert: Sound like you lived near a young fossil hunters dream location. Thanks for the visit and comment. @ManipledMutineer: Thank you - always appreciated. Another excellent lens, which takes me back to my collecting days! @karen-stephens: Thank you for the visit and blessing - always appreciated. The Kid is us all, never leaves - thank goodness! Thanks for the great lens.. do I qualify as a kid too? @LaughingLady LM: Thank you for your visit. @anonymous: Thanks for visiting my lense - appreciated. @AstroGremlin: Thank you for the visit, I'm sure that there are many more new fossils yet to be discovered. I'm imagining all the fossils that have yet to be found. Great article. Stunning lens for kids. Very well done! Thanks for sharing, enjoyed my time passing by your lens! @anonymous: Thank you so much. @MadameJoy: Thank you. Raising an interest in fossils at an early age, provides a fascination that can last a lifetime. Those fossil kits look great - my kids would be really into that. Maybe for the next birthday or holiday! @tfsherman lm: Thank you. It is very much appreciated. What a great resource! I've pinned you to my Summer Reading Program 2103 board. The national theme this year is Dig It, and this lens is very timely. Thanks! @flinnie lm: Thank you so much for the visit and blessing - always appreciated. I enjoyed reading this lens about fossils. Blessed and added to my lens Squid Angel flinnie. @DesignSpace: One of my favourite fossils as a child was a fossil shark tooth - I was in awe of it. I used to collect fossils as a kid. Still have a fossilized cast of an ancient fish sat on my bookshelf, and a necklace with a fruit fly trapped in amber. They make such great and educational gifts for kids! @Gayle Dowell: Thank you for you visit. Fossils are such fascinating insights into our past. I've been a rock hound all my life. I loved coming across fossils of all kinds. Great lens! this is not giving me education! @savateuse: Thanks for the blessing - always appreciated.